This is a follow-up article on the metrics that were gathered after creating the article Track Docker Hub Metrics and the attention that this gained. I was completely floored when I witnessed the growth rate and how many pulls were actually occurring on the different repositories per hour/day. Let's take a look what's going on. What is a Docker Pull? I'm glad you asked. A Docker Pull is, in essence, a download of an image from the Docker Hub. When a docker run command is run for an image for the first time, the run command "pulls" the image to your Docker host for you to use. Clear? If not reach out to me our submit a comment below. Wait, what are you telling us? OK, my screenshot depicts about 3 weeks worth of data. Obviously, this is only a snapshot of what is really happening but you get the idea. I chose 3 different images so I wouldn't get blacklisted by Docker Hub for tracking too many at once. The pulls per hour for the different images vary quite a significantly throughout the day but it is interesting to track none the less. Ubuntu has been around since the beginning. Judging from the graphs it looks to be no slouch either with an impressive 129.4 Million Pulls and growing daily. Alpine is the new kid on the block as far as OS's go. So it is understandable to have fewer pulls than Ubuntu. 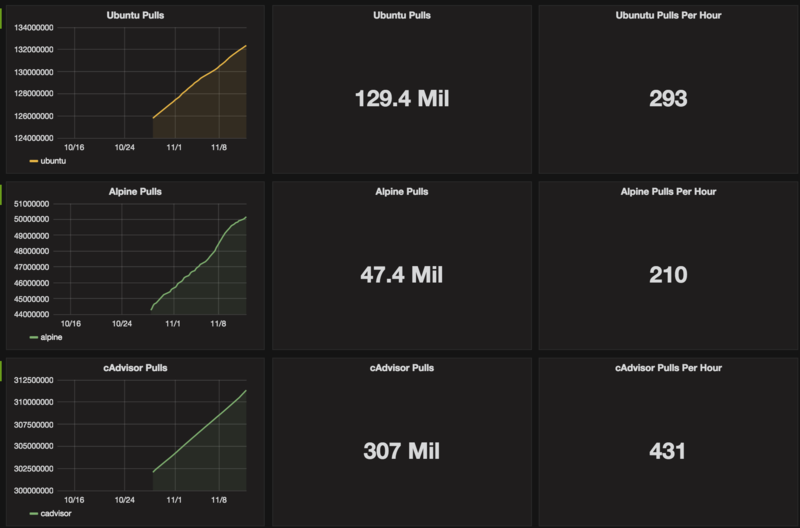 However, the growth rate of Alpine looks to be quite impressive and over the long term should catch Ubuntu. Notice the almost vertical growth after the first few days of monitoring. cAdvisor is a monitoring tool developed by Google and I've tracked the growth since very early on. So yes I'm monitoring the monitor so to say. I was absolutely shocked to see 307 million pulls which are more than Ubuntu and Alpine combined. Wow! Why so many cAdvisor Pulls? I reached out to the maintainers of cAdvisor and they were not able to shed some light on these numbers. They did point out that cAdvisor has been built directly into Kubernetes about 1 year ago which doesn't require pulls. However, the Google team were very happy to hear that cAdvisor was getting so much Pull love. The API metrics available from Docker Hub is very limited at the moment and only offers Pulls and Stars metrics for each image. So your guess is as good as mine as to who or what is driving the growth of these various images.